Anyone that’s ever attempted to surf knows that you need to be feeling your best both physically and mentally if you’re going to have a good time with Mother Nature. Unfortunately, too many of us are guilty for not taking proper care of our bodies by regularly stretching and this results in areas of tightness. This holds particularly true if you’re someone who spends a lot of time sitting down at a desk for your job (or otherwise), which, nowadays, is a lot of us. Human’s aren’t meant to spend a lot of time sitting and its estimated that 80% of us will suffer from back pain to some degree. Its suggested that long periods of sitting or not moving may be the culprit and simply incorporating more movement into our daily lives is the remedy. Yoga, at its core, is movement. Yoga is learning to move again in functional ways which can have a powerful positive effect to our bodies as well as our minds. These yoga poses aim at lengthening the spine and opening up at the hips and while these benefits are particularly useful for surfers it should also be noted that every one can benefit. But before you go ahead and start to practice these poses, it is strongly suggested that you take a few minutes to sit on the floor or your yoga mat and engage with your breath in order to reap the full benefits. Inhale deep and deliberate breaths, paying attention to the expansion of the chest as you do so. As you exhale notice how the body softens. Keep this awareness and attention on the breath throughout your practice and try to move with your breath. Downward facing dog is probably the most well-known and recognised yoga pose in the West, and for good reason! This pose is absolutely fantastic for the entire body and in particular your shoulders, hamstrings and calves. Upward facing dog closely mimics the position you are in before getting to your feet on a surfboard. This pose will help lengthen the spine while also opening up through the chest and shoulders. Practicing this pose will help your popups feel more stable and natural as well as relieving tension in your lower back. Tight hips are a problem area for most of us and the one legged king pigeon pose is arguably the most effective pose for opening up the hips while being a fantastic stretch for the thighs, groin and psoa muscles. The locust pose helps with strengthening the entire back part of your body, in particular the lower back which is typically undertrained and weak in most individuals. This post also heavily engages the core in order to remain in a stable posture. An easier variation is to have your arms pointed back towards your feet. Once you’re able to hold that for a minute then advance to having your arms overhead. Warrior II very closely resembles the stance you should have while standing on a surfboard and while this pose may look easy it requires a surprising amount of strength, balance and concentration - three things you will need as a surfer. One of the most common surfing mistakes is a stance that’s too close together and Warrior II will help build a strong and sturdy foundation. The child’s pose is brilliant for alleviating tightness in the upper back from a lot of paddling. Remember to take full and deep breaths and notice how your body softens and relaxes. While these poses are fantastic for an at home practice there is nothing that can beat doing it in person in a yoga class with a great instructor. 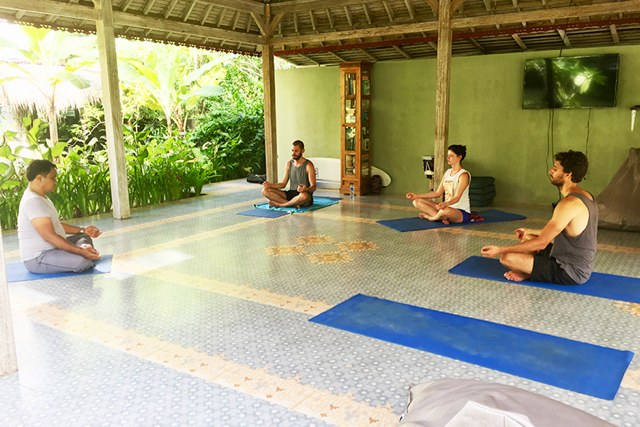 Yoga classes are just £7 a day per person and can be booked as an optional extra when you book to stay with us at Padang Padang Surf Camp.